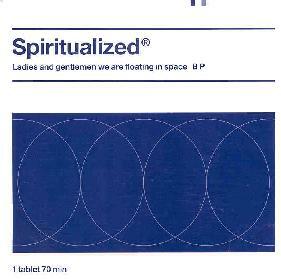 Spiritualized - "Ladies And Gentleman We Are Floating In Space"
The band's core sound, and the element that really grabbed me, is a wall of sound created by the horns and combined with synths, piano, and freakout guitar that will make you think Syd Barrett is back in action. Don't let the horns throw you... when it works it works, and it is some far out spacerock. The closest comparison I can come up with, and its a tenuous one, is Porcupine Tree. The disc opens somewhat like Porcupine Tree with a voice stating "ladies and gentlemen we are floating in space". After a bit of a buildup it launches into the horn-heavy rocker "Come Together". The eight minute "I Think I'm In Love" displays the band's main weakness in that they tend to get a nice groove going and don't take it anywhere. This tune and a few others seem to get too wrapped up with a good idea and are unable to develop it. Things really start to cook, though, with "All Of My Thoughts". The tune alternates between being an easy-going song and a complete space blitz. There is also some cool 60's style organ and a light, but still discernible piano line. "Electricity" is another heavy psych rocker that reminded me of Iggy Pop singing with Hawkwind. (an interesting image, huh?) Lots of organ and wailing acid slide guitar against that great horn wall of sound. "Home Of The Brave" and "The Individual" run into each other as a six minute instrumental. Here the horns become more than a trademark background sound and take on a crazed life of their own. Imagine a psychedelic Coltrane jam and you may well get something like this. One of the stronger tracks on the CD. My two other favorites were "No God Only Religion" and the seventeen minute epic "Cop Shoot Cop". Both feature brain piercing guitar work that hails back to the earliest Pink Floyd. "Cop Shoot Cop" starts with a beat-jazz coffeehouse feel with pulsating synths. Soon after the vocals begin the guitars come crashing in. The band really stretches out and alternating the instrumental excursions with the song aspect makes this a well spent seventeen minutes. I believe I read that this is the band's third release. Program your CD player to the half dozen really solid tracks and you've got a winner here. I've seen this readily available in record stores. You can visit Spiritualized at their web site.